Peter Tristram 07/11. 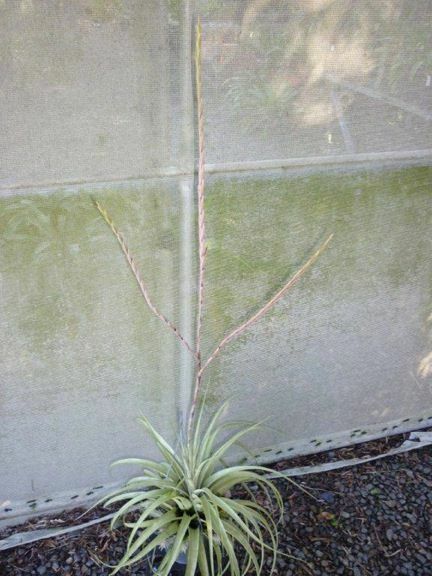 Paul Isley's plant from Rainforest Flora. Could be same as Bruce's plant. Peter Tristram 07/11. Collected near Cochabamba, between Chiclayo and Chota, Nth Peru 2003. Very thin spikes and rachis quite exposed. Short stolons. 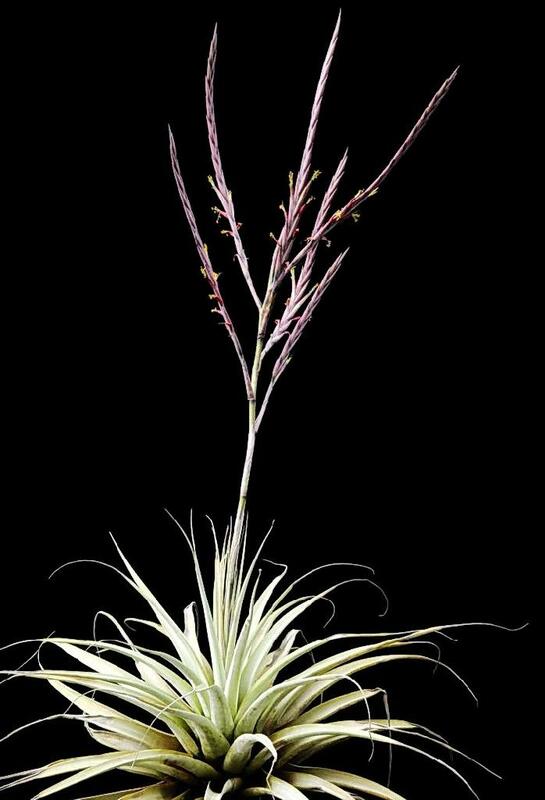 Grew with cacticola, straminea, a small spindly tectorum, and very long latifolia var divaricata. * - See discussion under T. hitchcockiana with Andrew Flower. Is it the same species ? Are they confused in our collections? Botanical description, thanks to Derek Butcher. 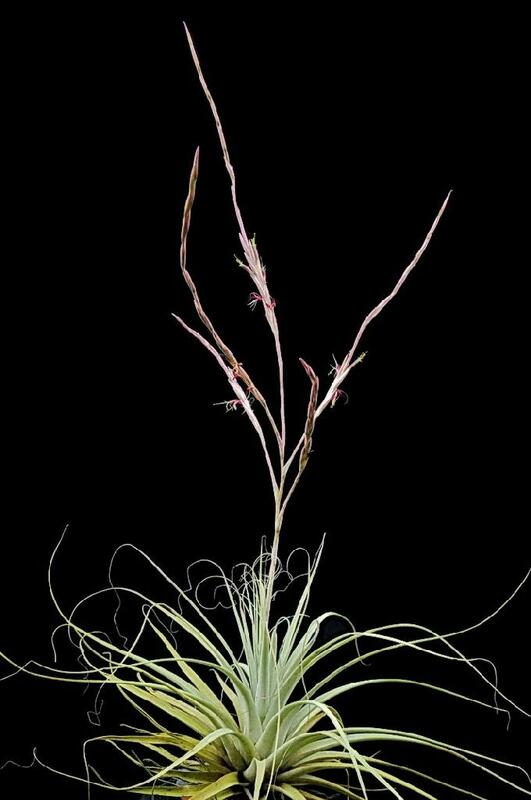 (See also T. hitchcockiana). Vriesea lopezii L. B. Smith, Phytologia 4: 218, pl. 2. figs. 8-10. 1953. Type. Samne to Caminche, Trujillo, Libertad, Peru, Lopez 846 (TRP, US), 21 May 1952. 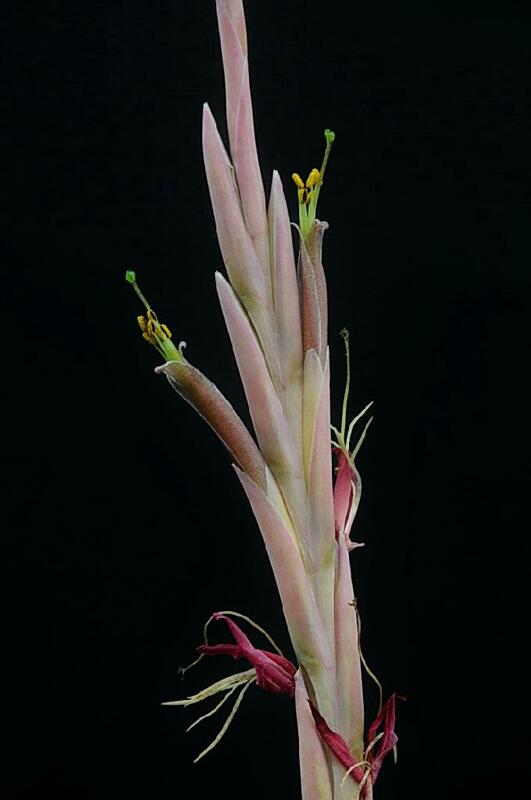 Plant stemless, growing in dense masses, flowering 1 m high with the inflorescence extended. Blades narrowly triangular, attenuate to a thick angulate-subulate apex, 4 cm wide, covered with coarse subspreading ferruginous-incanous scales. 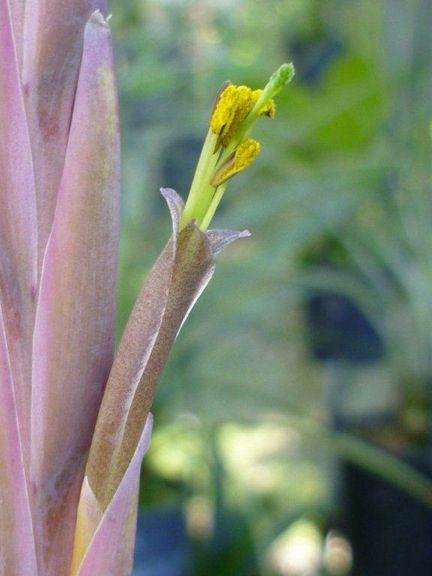 Scape-bracts tubular-erect, slightly exceeding the internodes, glabrous or subglabrous, the lower short-laminate, the upper obtuse. Rhachis undulate, angled, excavated next the flowers. Flowers 52 mm long (including the pistil). Type. Weberbauer 3025 (holotype B, F photo 11487), near Caraz, Ancash, Peru. DISTRIBUTION. Saxicolous and epiphytic, dry rocky slopes, 700-2200 m alt, northwestern Peru. PERU. CAJAMARCA: Jaen, Aug 1956, Rauh P-331 (US); Catache to Cumbil, Santa Cruz, 21 May 1965, Lopez & Sagastequi 5191 (TRP, US); Pampa Huangavilca, Val1e del Crisnejas, Cajabamba, 28 May 1965, Lopez & Sagastequi 5537 (TRP, US). LIBERTAD: Chaullacocha, Samne to Otuzco, 28 May 1960, Ferreyra 14100 (US, USM); Hacienda Chorobamba, Bolivar, 3 Jun 1960, Lopez & Sagastequi 3362 (TRP, US). ANCASH: Valley of Rio Santa, Aug 1956, Rauh P-270 (US); Canon del Pato, Huallanca to Caraz, Huaylas, 3 Jun, Ferreyra 14591 (US, USM); across Rio Santos from Mancos, 13 Apr 1970, C. E. Smith, Jr. 4953 (US); Caraz, 22 May 1970, Lopez et al 7394 (TRP, US). VRIESIA LOPEZII L. B. Smith. Phytologia 4: 218,pl. 2. Figs. 8-10. 1953. A V. barclayana (Baker) L. B. Smith, cui affinis, vaginis foliorum indistinctis, inflorescentia gracillima tereti, bracteis florigeris tenuibus nervatis glabris differt. Petals 35mm long, the blades elliptic, purple, the claw bearing 2 large oblong acute scales; stamens exserted. Plate II. fig. 8; Plant: 1/10; fig. 9; Sepal x 1; fig. 10; Petal x 1. Type in the U. S. National Herbarium, No. 2,100,204, collected at Samne-Casminche, Province of Trujillo, Department of La Libertad, Peru, altitude 1,600 meters, May 21, 1952. by A. Lopes M. (No. 846). 87. T. cereicola Mez in Fedde, Repert. III. (1906) 34. Metralis. Folia multa, dense utriculatim rosulata, ad 0,3 m longa, super vaginam ad 40 mm lata, inde in apicem crasse angulato-subulatum sensim angustata, rigida, lepidibus conspicuis ferruginascenti-incana. Scapus validus, arcuatim decurvus, folia subaequans, dense vaginis glabratis vel subglabratis, apice haud vel vix laminigeris summis rotundatis, tubulosis, internodia paullo superantibus indutus. Inflorescentia pendula, sat elongata, ad 0,4 m longa, e spicis 3-4 subaequalibus, ad 18-floris, utrinque acutis, flabellatis, usque ad 0,3 m longis et 15 mm latis mihi visis, optime complanatis composita; bracteis primariis quam spicae multo brevioribus; bracteis-florigeris strictissime erectis, manifeste imbricatis, ad 13 mm distantibus, chartaceis, glabris, ad 35 mm longis, sepala longe superantibus. Flores strictissime erccti, ad 52 mm longi; sepalis subaequilaliter liberis, coriaceis, glabris laevibusque, haud carinatis, acutis, ad 30 mm longis. Petalis violacea, ad 43 mm longa, tubulose erccta, quam stamina breviora. Peru: Dept. Ancachs, bei Caraz (Weberbauer n. 3025). Leaves many, forming a dense rosulate utriculum, to 30cm long, above the sheath to 40 mm wide, then gradually narrowing to a thick angular subulate tip, stiff, conspicuous brown grey lepidote. Scape stout, arcuate decurved, almost equalling the leaves, dense with glabrous to subglabrous scape bracts, with the tips of the blades not at all or a little rounded at the tip, tubulous, a little exceeding the internodes. 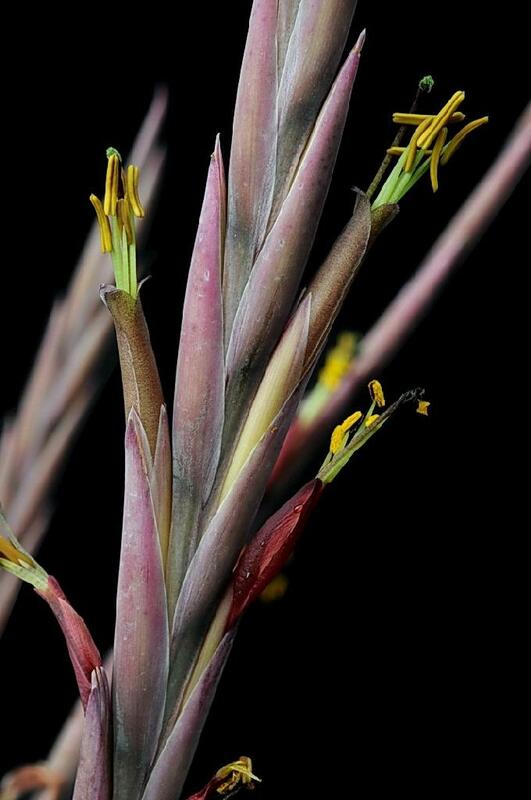 floral bracts very strictly erect, clearly imbricate, to 13 mm apart, papery, glabrous, to 35 mm long, long exceeding the sepals. sepals subequally free, leathery, slightly glabrous, not at all carinate, acute, to 30 mm long. Petals violet, to 43 mm long, tubular erect, shorter than the stamens. Peru: Dept. Ancachs, near Caraz (Weberbauer n. 3025).